Averroes depicted in a painting by Italian artist Andrea di Bonaiuto. Florence, 14th century. Averroism refers to a school of medieval philosophy based on the application of the works of 12th-century Andalusian Islamic philosopher Averroes, an important Muslim commentator on Aristotle, in 13th-century Latin Christian scholasticism. Latin translations of Averroes' work became widely available at the universities which were springing up in Western Europe in the 13th century, and were received by scholasticists such as Siger of Brabant, Boetius of Dacia who examined Christian doctrines through reasoning and intellectual analysis. The term Averroist was coined by Thomas Aquinas in the restricted sense of monopsychism and panpsychism in his book De unitate intellectus contra Averroistas. Based on this, Averroism came to be near-synonymous with atheism in late medieval usage. As a historiographical category, Avveroism was first defined by Ernest Renan in Averroès et l'averroïsme (1852) in the sense of radical or heterodox Aristotelianism. The reception of Averroes in Jewish thought, has been termed "Jewish Averroism". Jewish Averroist thought flourished in the later 14th century, and gradually declined in the course of the 15th century. The last representative of Jewish Averroism was Elia del Medigo, writing in 1485. The standpoints listed above resulted in two condemnations in 1270 and 1277 by bishop Etienne Tempier of the Roman Catholic Church. Tempier specified 219 different unacceptable Averroist theses. It has been pointed out that Tempier's main accusations are almost identical to those brought by Al-Ghazali against philosophers in general in his Incoherence of the Philosophers, which Averroës had tried to demonstrate to be unjustified in The Incoherence of the Incoherence. To resolve the problem, Siger of Brabant claimed that there existed a "double truth": a factual or "hard" truth that is reached through science and philosophy, and a "religious" truth that is reached through religion. This idea differed from that of Averroës : he taught that there is only one truth, but reached in two different ways, not two truths. He did however believe that Scripture sometimes uses metaphorical language, but that those without the philosophical training to appreciate the true meaning of the passages in question were obliged to believe the literal meaning. Giovanni di Paolo's St. Thomas Aquinas Confounding Averroës. The later philosophical concept of Averroism —along with the thesis proclaimed by William of Ockham— was the idea that the philosophical and religious worlds are separate entities. However, upon scrutinizing the 219 theses condemned by Tempier, it was obvious that not many of them originated in Averroës. Radical Aristotelianism and heterodox Aristotelianism were the terms commonly used for a while to refer to the actual philosophical movement started by Siger and Boëthius and differentiate it from Averroism; nowadays most scholars just call it Averroism as well. Thomas Aquinas specifically attacked the doctrine of monopsychism and panpsychism in his book De unitate intellectus contra Averroistas. Although condemned in 1277, many Averroistic theses survived to the sixteenth century, particularly in the University of Padua, and can be found in the philosophies of Giordano Bruno, Pico della Mirandola, and Cesare Cremonini. These theses talk about the superiority of philosophers to the common people and the relation between the intellect and human dignity. In the centuries following Averroes' death there were many Jewish Averroist philosophers, notably Elijah Delmedigo; Gersonides wrote a supercommentary on Averroes' Aristotelian commentaries. Some Averroist influence has been traced in Leone Ebreo's Dialoghi d'Amore. Baruch Spinoza was also notably influenced by Averroism, his panentheism flowing from Averroistic monopsychism, as was Spinoza's belief in the higher state of the philosophers and tendencies toward secularism. Arguably, Spinozan Averroism went on to influence Jewish Conservatism and Reconstructionism . There was no formal school or movement of Rushdiyya ("Averroism") in the Islamic tradition. The decline of Kalam or "Islamic scholastic theology" and Muʿtazila or "Islamic rationalism" has precluded a reception of Aveorres in Islamic thought that would parallel that in Christian or Jewish philosophy. Nevertheless, a revival of rationalist traditions in medieval Islamic philosophy has been called for in modern Arab nationalism. Averroes became something of a symbolic figure in the debate over the decline and proposed revitalization of Islamic thought and Islamic society in the later 20th century. A notable proponent of such a revivival of Averroist thought in Islamic society was Mohammed Abed al-Jabri with his Critique de la Raison Arabe (1982). ↑ Sonneborn, Liz (2006). Averroes (Ibn Rushd): Muslim Scholar, Philosopher, and Physician of the Twelfth Century. The Rosen Publishing Group. p. 89. ISBN 1-40-420514-4. Retrieved November 3, 2012. 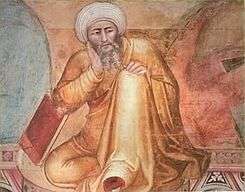 ↑ Averroes "was probably the most widely condemned thinker in the medieval Christian world... Averroism became virtually synonymous with atheism in the late Middle Ages and early Renaissance." Cantor, Paul A., "The Uncanonical Dante: The Divine Comedy and Islamic Philosophy", Philosophy and Literature, 20.1 (1996), pp. 138-153. ↑ He says that "the history of Averroism is the history of a misunderstanding" (referring to misleading Latin translations of the Arabic; for example, the word mutakallamin (literally "speakers"), which in Arabic was the normal term for theologians in general, was translated in the Latin versions of Averroes' works as loquentes, giving rise to the accusation that Averroes dismissed all theologians as "chatterboxes". ↑ Alain de Libera, introduction to L'Islam et la raison. ↑ Nicola Missaglia, "Mohamed Abed Al-Jabri's new Averroism"
Averroism from the Jewish Encyclopedia (1906) - Averroism and the philosophy of Judaism. "The Eternal Conversation", a personal account of Averroism in the Medieval and Modern Jewish intellectual tradition.